Today I thought I’d take a brief look at a magical ingredient which most everyone has on hand: Black Pepper. There are many uses for this dried fruit of the Piper nigrum plant. Of course it’s valued for its ability to enhance food with a bit of heat, but it also has medicinal properties, and is very common in hoodoo practice as well. 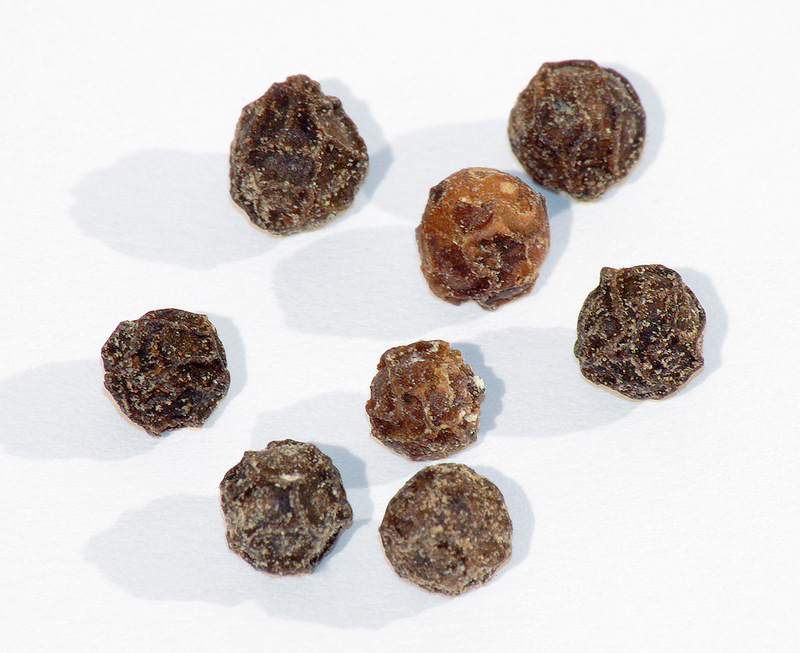 Botanical.com lists the black peppercorn’s medicinal properties as being a febrifuge (fever reducer) and a stimulant and carminative. For those with enflamed throats or ailments of the uvula, the site recommends using an infusion of black peppercorns as a gargle, and also suggests using the herb for constipation and urinary troubles. “Snuffing entailed having the mother sniff black pepper…from a plate placed under her nose; quilling involved blowing the same substances directly into the mother’s nostrils or throat with a goose quill, reed, or rolled piece of paper. Either way, the objective was to cause a violent sneezing attack that would induce labor” (Folk Medicine of Southern Appalachia p.130). “To shield yourself from anyone doing these things [poisoning you through the feet via powder or other foot-track magic]…sprinkle black pepper powder or a mixture of black pepper and Fear Not to Walk Over Evil Powder in your shoes. It is said that your track will be invisible or invulnerable to harm, and even if someone does throw for you or lift your foot track, they won’t be able to affect you in any way” (HHRM, p.53). She also mentions that black pepper can be mixed with salt and thrown after someone when they leave your home to prevent them from ever returning or doing you harm. Since salt and pepper are rather easy to come by in most homes, doing a spell like this is simple, and because the ingredients are so common most people don’t think twice about seeing them on the ground. In fact, a light sprinkling of these ingredients would probably go unnoticed even in a busy apartment complex, and would be easily vacuumed up later, which makes a spell like this good for the urban root worker or witch (in my opinion, of course). I’d combine it with the practice of leaving a broom behind the door just to double up the protection from unwanted visitors, too. There are several potent curses which can be levied using black pepper, too. Catherine Yronwode’s Hoodoo Herb & Root Magic book has an excellent entry on these, so I’ll not rehash everything in her entry here. I will say that the spell she mentions involving a black candle and 99 peppercorns taken to a crossroads sounds particularly nasty, and would be well worth learning, if only to have an idea how to undo it should someone do it to you. That’s it for today! I wish you all a wonderful weekend. Please don’t forget to vote in our polls, too! They’ll be open through the weekend, and you can find them in Blog Post 61 or at the top right of the sidebar. Thanks for voting, and as always, thanks for reading! This entry was posted on May 21, 2010 at 9:30 am and is filed under Practice & Technique. You can subscribe via RSS 2.0 feed to this post's comments. An excellent post on pepper Cory. It’s one of my personal favorite spices, as well as just friggin’ handy for conjure work. I always keep non-iodized salt and whole peppercorns on hand, as I find they are quite useful in purification/banishment workings, respectively. I find both crushed red and black pepper particularly effective in curses, or in fast workings. I did not know the health properties of pepper though, so I’ll add that to the ol’ database. Thanks much for the info, as always 🙂 .